Shopify has released a fantastic new tool, Shopify Flow, which helps merchants easily automate common tasks, reducing the amount of time and effort required to run your store, freeing you up for other important tasks, and creating a better experience for customers. 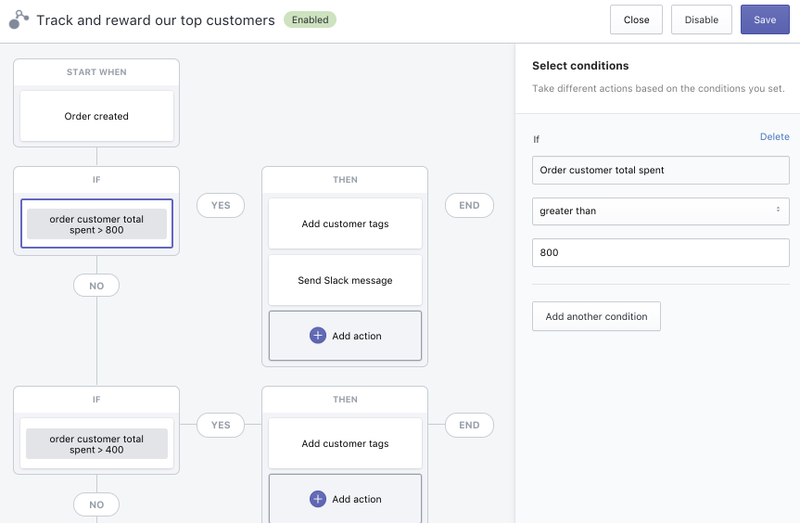 Shopify Flow uses internal events, such as an order being created or a new customer being added, to trigger other defined actions. It’s a sophisticated if-this-then-that (IFFF) workflow, which checks that certain conditions are met and then runs a specific action. All you had to do is set it up once, and then let the magic happen! Your mind is the limit when it comes to the different trigger-condition-action workflows you can create. Want to reward loyal customers that spend more than $1,000 in one month? No problem! Need to send a message to customer support when a large wholesale order has been placed? You got it! Wish you could send an email to re-order product when inventory is low? Easy peasy! Flow is available for all Shopify Plus merchants. If you’re interested in using Shopify Flow with your store, get in touch with us to learn how you can get started.